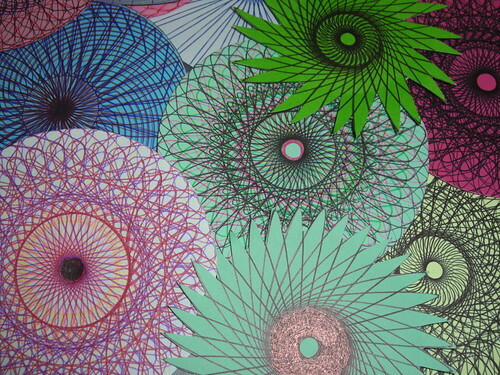 This experiment consisted on another spirograph plate. I used the same method as the previous spirograph experiment but only this plate had 19 sounds/patterns. The sounds of the patterns merged together are quite different than before, though the visual effects are very similar when no effects are used. In the first video below I added some post productions effects to blend the spirograph patterns. The second video has no effects other than using the zoom lens on my camcorder to make the patterns move. Exploring the sounds and visual effects of spirographs together. 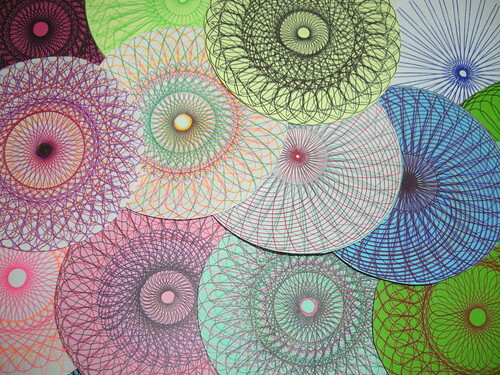 This is an experiment recording each individual sound/pattern of a spirograph. The project involved first picking a random spirograph plate, then drawing each of the possible spirograph patterns on that plate using randomly selected coloured pens. First I had the system (1) the spirograph pattern. 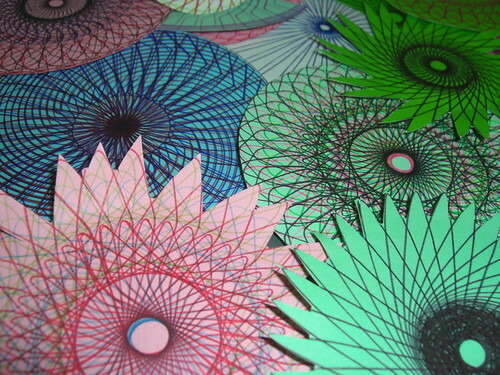 I also had the random elements (2) the choice of spirograph plate & the choice of coloured pens used. I filmed as I created 13 different spirograph patterns using various coloured pens & then extracted the 13 different audio recordings from those recordings. I then created a ‘sound collage’ by combining the sounds of the 13 different audio tracks. To this I added the visual effects which were accidentally created by zooming the camcorder onto the drawing which naturally created the movement. I had no idea this would happen and it was quite interesting to observe the effects of the zoom lens on the static drawing. I am quite pleased with the outcome of this experiment. I found bringing all the patterns/sounds together expresses a rather stressful emotion overall. Whilst the colours are very calming and the individual patterns are very pretty, the overlaying of all the patterns/sounds within the spirograph are quite stressful. The movement is reminiscent of a heartbeat trapped within a system which is articulated by the merging of the visual/ sound and movement creating a disturbing yet contradictory effect against the visuals of the calming colours. I found the outcome to be quite weird as this is very similar to previous work where I deliberately set out to create similar contradictory emotions. Yet with this I had no idea of the outcome. Exploring the notion of how individuality exists within a system. My primary aims for this project are to create a video/audio installation that expresses and questions the transformation of individuality within the conglomerate. I intend to explore the notion of how individuality exists within a system, along with questioning the notion of individualism/mechanism in my work (this may change depending on the perspective). Since this topic is quite complex I can only really hope to explore aspects of this vast subject. I aspire to convey these ideas by experimentation with pattern transformations and randomness using a process for the making of the work called Generative Art. To research Chaos Theory, and experiment with repetitive but random processes within both the natural and electronic realms. To obtain a clearer understanding of the natural world. To gain knowledge of theories and ideologies that may contribute to the making processes of Generative Art. Acquire information from artists that already use this method. Explore and create my own art using this process. Project video onto kinetic sculptural forms. Create a collection of generated sampled sounds. Over the years my work has developed from making dynamic sculptures into creating multimedia installations, by exploring kinetics, sound and digital video. The historical context of my work can be found in a combination of art practices from Kinetic Art, Anti-Form Movement/Process Art, Video Art and Sound Art. In the past I have been intrigued by the Kinetic ready-mades of Marcel Duchamp. The Anti-Form movement and artworks by Robert Morris titled Scatter, Richard Serra’s Splatter, and the Subway Drawings by William Anastasi as they all have a dynamic quality and an element of chance. I am also fascinated by Video Art and the works of Nam June Paik, along with the experimental generated Sound Art by John Cage. The contemporary artists and artworks that I will be researching for this project will be by Brian Eno, Philip Galenter, Bill Viola and Amy Stacey Curtis. At the time of writing, and as far as I am aware the most relevant contemporary artwork that relates to my research is called 77 Million Paintings by Brian Eno. This is a generative artwork that reflects notions of individuality and transformation within a collective. Dynamic Systems: Generative Art Processes, and Chaos Theory. Popular Culture: Dystopian Future films and books. Theologies: Buddhism, Judaism and Christianity. Primary Research/Contextual: I have contacted Generative Artist/Theorist Philip Galenter and arranged to interview him later in the year. I will be also be researching other practitioners: Brian Eno, Bill Viola and Stacey Amy Curtis. I will examine not only their artwork but also research how they judge what is objective and observable. I will also visit exhibitions, galleries and museums. Visual Research: Taking photographs/video clips and drawing. Research Chaos theory, Benoit Mandelbrot and explore making sculptural patterns within the self similarity principle. Create rules similar to tradition board games and apply them to my artwork. Experiment with real-time video feedback to induce patterns and generate visual effects. Learn and experiment with programming: Processing, and Scratch. Learn how to generate fractals with the programme called ChaosPro. Experiment with a collection of generated sounds by sampling sounds from generative instruments and sound sculptures such as Aeolian Harp, Wind Chimes, The Blackpool High Tide Organ, The Sea Organ and The Ringing Singing Tree, and possibly make my own generative instrument. Experiment projecting video onto sculptural forms. Theoretical/Subject Research: To research Dynamic Systems: Generative Art Processes and Chaos Theory. Popular Culture: Dystopian Future films and books. Philosophy: Existentialism, Atheism, Marxism. Theologies: Buddhism, Judaism and Christianity. Reflective research: This would possibly be in two stages, the first stage to collect and reflect on of all the relevant information gathered to write my reflective paper. This would contain information gathered from all the research sections, along with reflection on blog entries, from feedback of tutorials and group critiques to create my artwork for the final project. The second stage would be after my final exhibition. During the exhibition I would leave a comment book that will also contribute to the knowledge and feedback gained from the exhibition. I am planning to create a digital video/audio installation where either video is projected onto a kinetic sculptural form or possibly there will be a kinetic sculptural installation and a video projection separately but within the same area. At this point I’m not sure about the exact outcome, though the space required will be the approximately the same: 3.5 metres squared. However from previous experience while setting up my BA Degree Show I realised that space can be limiting, and I may not be able to obtain my chosen amount of space. If this is the case I will need to know how much space I would have to work with beforehand so I can experiment within that space. Ideally I would like this area to be built with walls around and a doorway to enter that is also big enough for wheel chair access. I envision the installation to have an immersive quality where only one or two people would enter at a time. I will need to specify that my installation will only be suitable for either one or two people entering at one time. I will do this either on a separate notice or on my personal statement so people can read before entering. This will ensure that overcrowding does not occur and that people can exit easily in case of an emergency. The kinetic sculptural installation will be powered by batteries which is not a concern as they will be hidden from view. I’m not sure at this point where the projector will need to be placed but both computer and projector will be out of the way so not to cause distraction from the artwork. I will need to see where the nearest plug sockets are and take into account the possible use of extension leads. For any cables running along the wall or floor to computer and projector I will use a combination of either cable clips or floor cable covers for both neatness and safety. All cables will need to be tested by an electrician for health and safety purposes prior to the exhibition. are the major stages of my work plan. The details of each section can be found in my methodology that I previously mentioned. My plan is to research and complete all the areas mentioned in a constructive manner. While I have highlighted a combination of the research topics for the same duration this does not mean that I will constantly be researching them all every day, but what it does mean is that I will switch back and forth for each topic during this time frame until each section is completed. At this stage I do not know when all the course deadlines are so having a flexible timetable that I can change and restructure is also important to achieve these goals. Austin, H. James (1999) Zen & the Brain. Massachusetts, MIT Press. Casey, R., & Fry, B. (2010) Getting started with processing. Sebastopol, O’Reilly Media Inc.
Comer, S. (2009) Film & video art. London, Tate. Dawkins, R. (2006) 3rd ed. The Selfish Gene. Oxford, Oxford University Press. Degrazia, D. (2005) Human Identity & Bio Ethics. Cambridge, Cambridge University Press. Haralambos, M., & Holborn, M. (2008) Sociology themes & perspectives. London, HarperCollins Ltd..
Humphreys, C. (2005) A Popular Dictionary of Buddhism. Richmond, Curzon Press. This edition published in the Taylor & Francis e-library. Huxley, A. (1994) Brave New World. Flamingo. Koterski, J.D. (2009) Biblical Wisdom Literature. Fordham, The Teaching Company. Johnson, S. (2002) Emergence. London, Penguin Books. Kreeft, K. (2007) The Philosophy of Jesus. South Bend Indiana, St Augustine’s Press. Macey D. (2001) Dictionary of Critical Theory. Penguin. Machan, T. R. (1998) Classical Individualism. London, Routledge. This edition published in the Taylor & francis e – library, 2005. Nies, A. (2009) Computability & Randomness. New York, Oxford Science Publications. Orwell, G. (2008) 1984 Nineteen eighty-four. London, Penquin Books Ltd..
Parberry, I. (1987) The Parallel Complexity Theory. London, Pitman Publishing. Paul C., (2003). Digital art., London, Thames & Hudson. Rand, A. (1964) The Virtue of Selfishness. Canada, Signet Books. Rush, M. (1999) New media in the late 20th – Century art. London. Thames & Hudson. Russel, B. (1975) Why I am not a Christian. London, Unwin Paperbacks. Sardar,Z, &Abrams, I. (2004) Introducing chaos. Royston, Icon Books. Sartre, JP. Barnes, H, E, ed. (2003) Being and nothingness, London. Routledge. Schneider, E. et al.(eds.) (2003) Mariko mori wave UFO, Kunsthaus Bregenz. Sutra, M.D. (2008) Quantum Buddhism. F.Lepine Publishing. Tyson, L (2006) Critical Theory Today. London, Routledge. Williams, P. Garnett. (1997) Chaos Theory Tamed. Washington, D.C. Joseph Henry Press. Gamer (2009) Mark Neveldine & Brian Taylor, UK, Lakeshore Productions, 95mins. Kurt Vonnegut’s Harrison Bergeron (1995) Bruce Pittman, USA. Atlantis films Ltd., 99mins. Kurt Vonnegut’s Harrison Bergeron 2081 (2009) Chandler Tuttle, USA, Moving Picture Institute, 25mins. Nineteen Eighty – Four (1984) Michael Radford, UK, Umbrella Rosenblum Films Productions 113mins. The Island (2005) Michael Bay, USA, Dreamworks, Warner Bros., 136mins. Burraston, D. (2007) Fundamental Insights On Complex Systems Arising From Generative Arts Practice. Leonardo. Vol. 40, Issue 4, pp 372-373. Harle, R. (2008) YLEM Journal: Artists using Science & Technology. Leonardo. Vol. 41, Issue 5, p.531. Leggett, M. (2007) Generative Systems & the Cinematic Spaces of Film & Installation Art. Leonardo. Vol. 40, Issue 2, pp.123-128. Mcknown, R. (2005) Fort Andross/Brunswick: Amy Stacey Curtis: Third Solo-Biennial: Change. Art New England. Vol. 26, no.2, p.22. Monro, G. (2009) Emergence & Generative Art. Leonardo. Vol. 42, Issue 5, pp.476-477. Schedel, Mg., & Rootberg, A. (2009) Generative Techniques in Hypermedia Performance. Routledge. Vol. 28, No.1, pp.57-73. Stasukevich, I. (2008) Crossing Over in Viola’s “Ocean Without a Shore.” American Cinematography. Vol. 89, no.3, p.10, 12, 14. Chaos (Documentary) (1992) Steward, I. Radio BBC Radio 4. Odyssey 5, Complete Series (2006) Adam J. Shully, David Carson & Jim Michaels, USA, Sony Pictures, DVD, 935mins. The Prisoner,17 episodes, (1967-1968) Patrick McGoohan, et al, TV Series, ITV. British. 48mins (each episode). The Secret Life of Chaos (Documentary) (2010) Stacey, N. TV. BBC Four, 9 Dec. 19.30 hrs. 60mins. http://www.fabrica.it/workshops/sterling_videos.html [Accessed 20th November 2010]. http://fora.tv/2006/06/26/Will_Wright_and_Brian_Eno [Accessed 15th December 2010]. Galenter, P. What is Generative Art? Complexity Theory as a Context for Art Theory. [internet] http://philipgalanter.com/downloads/ga2003_what_is_genart.pdf [Accessed on 2nd Janurary 2011.